Oh, how I love stamps! I forget this until the Liberate Your Art Postcard Swap envelopes come rolling in, and I get to see these awesome postage stamps from all over the world. They are an art unto them selves. Like last year, I will soak them off and save them for future use. I have no idea what use, but I will come up with something! After a week away, I received a big stack of envelopes for the swap when I picked up my mail yesterday. So much fun! So many stamps!! Right now there are 273 artists signed up for the swap, so there will be many more envelopes coming in over the next few weeks. So much art to be liberated into the world! Awesome!!! Sign up is open until July 15, so there is still time to join in or to share the swap with your artist friends. It’s been great to see the chatter in the Facebook group about people ordering, receiving and sending their postcards. Join us there too! I’m also surprised when I receive little notes of encouragement and fun for me along with the envelopes. I don’t expect that! I receive two postcards addressed to me along with the stack of envelopes. Thanks Katie and Linda! And today’s mail art comes from Nora Clemens-Gallo. I didn’t want to ruin this envelope by opening it! Thanks Nora, for the extra art liberated! 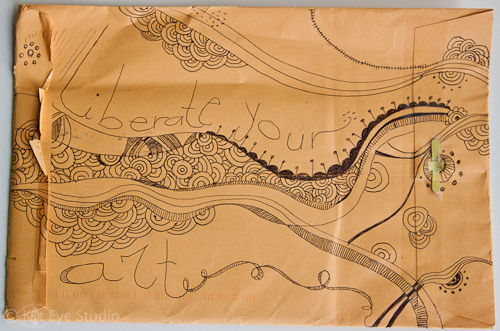 It’s time for an update on the Liberate Your Art Postcard Swap! As of this week, there are 181 people who have signed up, and I’ve received my first two envelopes. Yay! That may seem like I’ve reached my goal, but if last year is any indication, only about 70% of the artists who sign up will actually participate. That means I need a lot more people to join up to increase participation over last year! Can you help? Share about the swap on your blog, twitter or facebook page. I’ve even created a Facebook Event to make it easy to share with your creative friends, click here. Won’t it be great to have all of that art reaching mailboxes around the world? I can’t wait! I can imagine some wonderful art coming to these rural mailboxes, can’t you? They were so cheery, with the riot of flowers surrounding them. I played around with the processing and created another Lightroom Preset called “Mail Call,” which you can download here. It’s got a similar feel to Your Art Here, but the result is a little bit warmer with less desaturation in the reds and greens. I like the sunny feel of it! Today is also the day I’m sharing my painting progress this week for Paint Party Friday. I’ve continued both paintings from last week, but this is the one I’m happiest with at the moment. 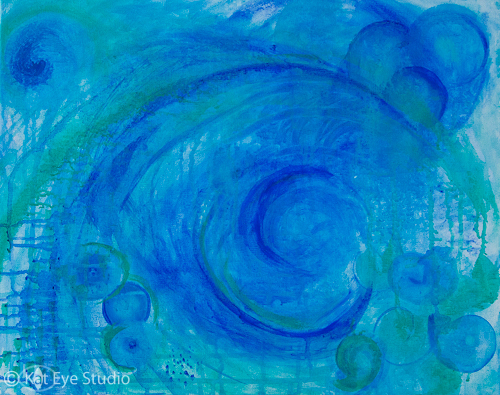 It has a definite aquatic feel and I’ve continued to maintain the wave shape that originally appeared on the canvas as I build the layers. I think I’ll add some white next and see what happens. Happy Paint Party Friday to all! 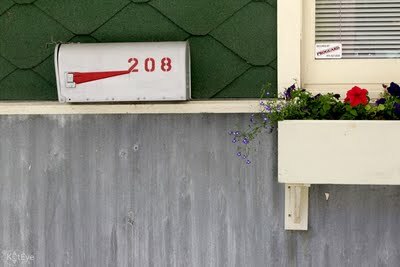 As I mentioned yesterday, one of my latest fascinations is mail boxes! (“Letter boxes” for those of you in the UK.) These are disappearing around the US too, just like parking meters. Replaced by safer and more efficient shared post boxes, these are a bit of life that is going away. I remember the excitement as a child, of putting up that flag when the box had mail and seeing it down later in the day after the postman had come. I would run to see what had arrived in the mail. It’s sad, I don’t even have one in front of my house now. We walk up the street with a key to see what arrived, and it’s usually junk. Bills don’t even come anymore, they are sent via email. 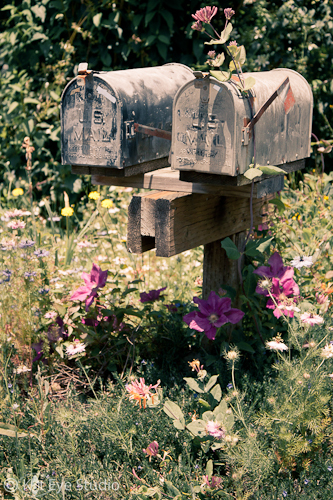 Mail boxes are a symbol of so much else disappearing too, personal mail and the written letter. 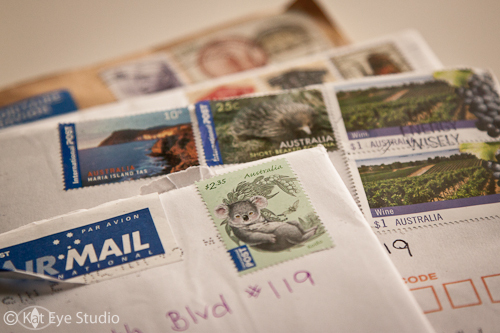 We all love to get mail but how often do we send it? Not so often. 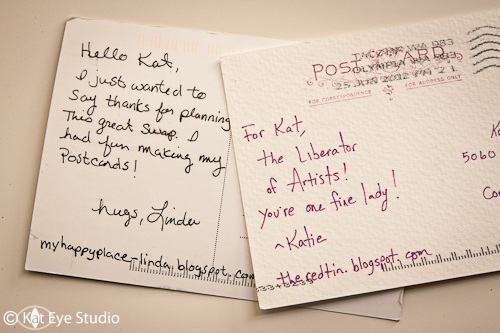 That’s why the Liberate Your Art postcard swap was so much fun for many of us. For a little while, we got fun mail! In honor of little-used mail boxes everywhere, let’s all send a postcard or a letter or a note to someone we care about today. I’ve got my pen out now! Won’t you join me? The current Exploring with a Camera theme is Process of Elimination. Check out the post and explore with us. You can subscribe to the Kat Eye News to stay up-to-date on all the happenings. Last week, as I walked through the gate of our apartment building, the portinaia (doorkeeper) flagged me down to give me this package. It was the most interesting package, covered in all sorts of stamps from the UK, addressed to my husband. “Oh wow,” he said when I brought it into the apartment, “I didn’t think that would ever come!” Turns out he had ordered some mosaic tiles from a shop in England, five weeks earlier. I asked him to save the package for me, so that I could photograph it. 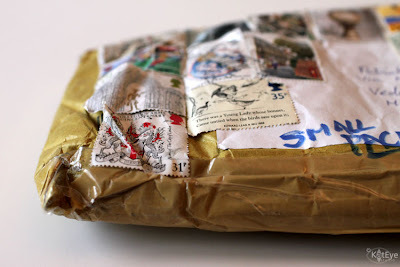 I was intrigued by this wrinkled envelope, covered in colorful stamps. 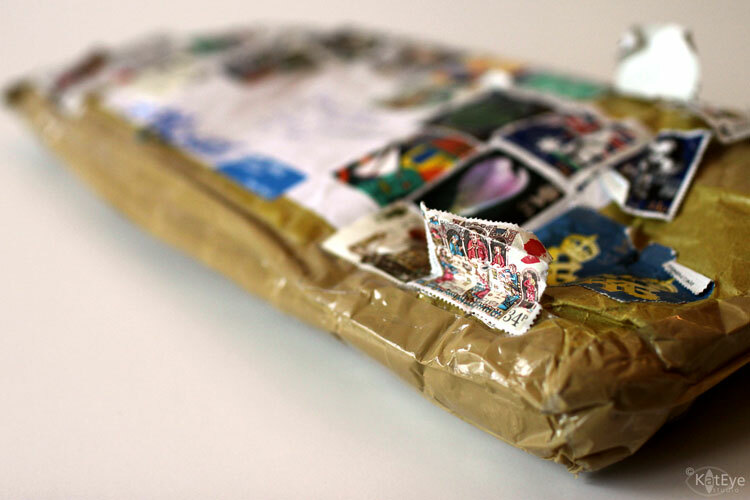 What stories would this package tell, if it could talk? Could it tell me the story of why it had such a diverse set of stamps? Maybe someone had cleaned out their desk, and they were trying to use all of the old stamps that were left over when postage increased. What about its journey? What would it tell me? How did it get to be so crumpled and rumpled, with the stamps peeling off? Why did it take so long? Maybe it was waylaid, because it needed to be hand cancelled. Or possibly it got stuck in some sorting machine. Likely the delay was due to Poste Italiane, famous for its inefficiency, but I like the fanciful stories better. After photographing the package for a while, I decided to soak the stamps off and save them, for some craft project in the future. When a treasure trove of textured imagery comes your way, you have to take advantage of it. 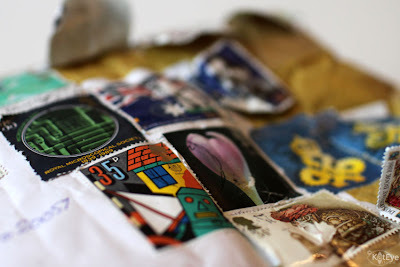 Reaching back into my brain archives, to a time in my childhood when I was a junior stamp collector, I taught Brandon how to remove the stamps without damaging them. It wasn’t until I had removed the stamps that I realized all of the stories they collectively carried with them. There was the College of Arms Quincentenary, World Hockey Cup London 1986, and Royal Mail 350 Years of Service. The Most Ancient & Most Noble Order of the Thistle Tencentenary of the Revival, The Domesday Book 1086 and The Queens Award for Technological Achievement 25th Anniversary can be added to the list. Some celebrate artists as well: Sea Pictures by Edward Elgay, a photograph of Alfred Hitchcock by Howard Coster, and a vase by Hans Coper. A total of 24 stories are held in the stamps on this one little package. Normally we don’t stop and notice the stamps on our mail. We don’t stop to think of the story they are representing. In fact, it’s becoming rarer to actually have stamps on our mail, with the decline of people sending personal mail and the increase in use of electronic postage. What luck then, to receive a package like this. It’s a treasure trove of culture and history and art. If any of my UK readers can fill me in on the story behind this colorful stamp with the yellow house and the green robot looking guy, I would love to hear it! Today’s 9 Muses Musing prompt is STORIES. I don’t know about you, but I’m enjoying these prompts. They are inspiring me to tell stories I wouldn’t have told otherwise. Tomorrow’s prompt is TRADITION.